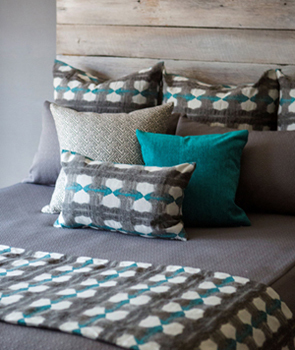 CottonBelle specializes in custom soft goods for the home — pillows, cushions, futons and covers, bedding, and curtains. Browse our carefully selected line of fabrics and then let us help you create your own beautiful, comfortable surroundings for your home. Contact us if you have any questions or are looking for a furniture dealer near you. Choose from CottonBelle's open line of fabric or your own fabric for any of CottonBelle's bedding goods. Sizes are in inches. For bed pillows, bolsters and trims, see Pillows. Duvet cover and pillows Cobalt Garden and Vista Cobalt. 4 inches of wool encased in poly cotton duck. Toppers are placed on your mattress and secured by elasticized corner straps. They provide the ultimate in warmth and comfort. Bed skirt in Robin Stripe. A smooth look with neat pleats and split corners. Please specify drop. 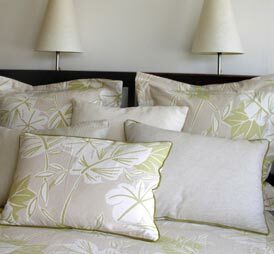 Duvet cover and pillows in all-cotton Zen Leaves and Soft File Natural. Like bedspreads, coverlets are hemmed with rounded corners. These comforter or duvet covers can be used with insert or alone as lightweight blankets. Available with or without cording. 1 inch of wool encased in 100% washed cotton sheeting. Comforters are used as an insert with duvet covers. Lightweight goose down with 280-thread count. 100% cotton cover. Comforters are used as an insert with duvet covers. All futons are handmade with a rugged construction that features full corners, consistent sizes and quality, and no tearing at tufts. Futons have 24 tufts on full and queen sizes to prevent shifting except for the Econolite and Wool futons, which have fewer tufts since these ligher futons don't shift as much. 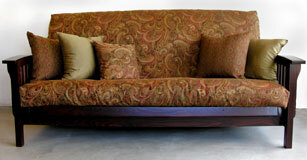 Futons are backed with a five-year warranty on workmanship and materials. See how our futons are made. Above: Futon cover in Arabesque. Pillows in Arabesque, Eyen and coordinating solids. Left: Chair-sized cover in Tulip Poplar. Sizes are in inches. Custom sizes also are available. Contain 50 percent high-loft polyester/50 percent premium cotton blend for the most resilient futon over time. Have 1.8-density/ 2 3/4-inch convoluted polyurethane foam. Have 5 1/2-inch pure latex foam derived from the rubber tree. Are encased in 6.5-ounce duck casing. Conform to the Federal Flammability (Open Flame) standard for mattresses, 16 CFR 1633. Have 100 percent cotton barrier cloth. All standard covers are made with a flap closure; a three-sided zipper is in the back seam. Chair and ottoman covers are made the same way except with a two-sided zipper. Choose from CottonBelle's open line of fabric or your own fabric. 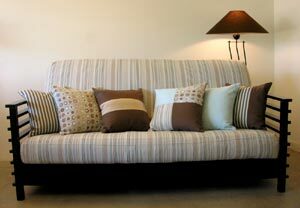 Futon covers in Milk Chocolate Stripe. Pillows in Polka, Robin, Robin Stripe, Milk Chocolate Stripe and Milk Chocolate. Covers are made with a 5-inch corner that fits most 6- to 8-inch standard cotton and foam futons. A minimal charge applies to any increase in loft size of 6 inches or greater. Cording is available on top and bottom of futon covers for an extra charge. Easy covers are made like a fitted sheet for economy and for ease in taking on and off. They are great for areas often visited by pets and kids where more frequent cleaning is required, and also for homes of those who are physically limited when changing covers. There are no zippers. They are great for daybeds and sofa-type futon frames, but not for tri-folds. Available in full, queen and king sizes. 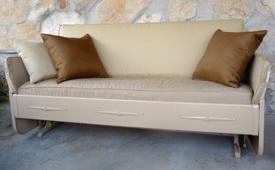 Top: Vintage glider in Golden Sands with Marzipan pillows. Left: Outdoor cushions in CottonBelle's open line of fabrics. 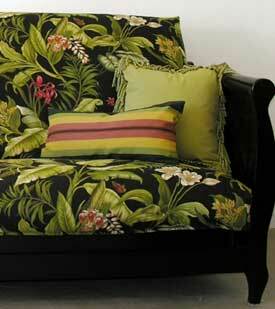 Choose from more than 50 fabrics for outdoor cushions in traditional solids, stripes, designer prints and wovens. These fabrics feature the fade-, stain-, and weather-resistant properties of solution-dyed Sunbrella® acrylic and spun polyester. Indoor/outdoor fabrics are durable new choices in decorating. 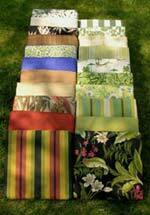 They are great for patios, porches, sunrooms, dining rooms, living rooms, playrooms, kids, pets, showers and curtains. Both sides of cushion feature 1 inch of polyester and 1 inch of quick-drying foam in center. Custom sizes including bench and lounges are available. Piping also can be added. It is important that outdoor cushions are made with outdoor foam, polyester or both. Indoor/outdoor fabrics resist water, but are not waterproof. In heavy rains, water will pass through the fabric without the fabric absorbing moisture or becoming wet. Traditional futons are not appropriate for outdoor cushions. Pillows are one of the least expensive room makeovers – changing a whole room or adding a splash of color to a chair, sofa or bed. Pillow forms are available in cotton, feather down, polyester and buckwheat hull. Removable covers can be selected from CottonBelle's open line of fabric or from a customer's own fabric. Pillows in Wailea Stripe and Citron with bullion fringe. Futon cover in Wailea. Flanged and square pillows in Soft File Natural and Soft File Leaf. Neck pillows in soft colors of Charmeuse. Not only can pillows make all the difference in how your furniture looks, but also how you feel. Support your neck...by using buckwheat hull or soft cotton neck pillows and a soft fabric. Arms 20-inch pillow or 20x20x3 pillows can offer support. Lower back Lumbar 14x22 pillows feel great. Full back Full support from 24x24 pillows. Legs Give them a bolster pillow under the knees. Lounging Use a standard bed pillow with a lovely cover or oval bolster to stretch out on the sofa. Bed pillows both cushion hardwood arms and provide extra guest pillows. Down and feather inserts feel luxurious. Choose combinations that are just right for you. Relax and support all of your joints and enjoy your beautiful, comfortable sofa, chair or bed. Once you get started, look around at the rest of your room and consider accenting other pieces with coordinating pillows, floor pillows, custom window seats, and chair cushions. Create your own shower curtain in any size. Choose from our open line of fabrics or provide your own. CottonBelle has more than 50 water- and fade-resistant fabrics that are particularly well-suited for shower curtains. A liner also is recommended. Simple rod pocket, tab top and tie top treatments are popular choices as well as hemmed edges. 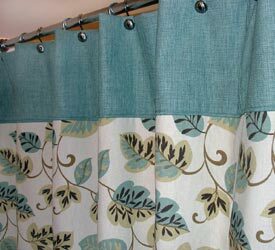 Rod pocket and hemmed shower curtains can be used with rings or clips available at stores carrying curtain hardware. Please call us at 573-859-6589 for custom quotes. Shower curtain in Leaflet and Aquamarine is water-resistant. Smaller steel grommets are rust-resistant. Grommet panels are ideal for a contemporary look for shower curtains as well as windows. 1 5/8-inch grommets can fit over rods up to 1 inch in diameter. Rust-resistant steel grommets are available for use with clips or rings. Just like the perfect fashion accessory, the right fabric treatment at your window works like a beautiful scarf or necktie to pull a look together and provide a great finishing touch. All of our fabrics are available for window treatments or shower curtains in standard and custom sizes. Flat Roman shade in Silhouette. 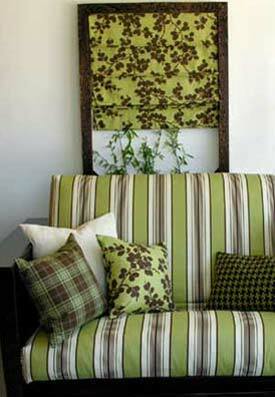 Futon cover in Acorn Stripe and pillows in Acorn Plaid, Silhouette, Acorn Stripe and Olive Houndstooth. Contemporary grommet curtain panels are great in the great room. Please specify if you want lining. Call 573-859-6589 for a quote or for more information. Although nearly flat when unfurled, this basic Roman shade draws up into graceful, horizontal folds. Rings are attached to pulling cords on the back of shade. This tailored Roman shade has stitching along the edge of the folds on the front that acts as a memory for the folds. The grommet curtain is ideal for a contemporary look. 1 5/8-inch grommets can fit over rods up to 1 inch in diameter.